The White House and U.S. National Institute of Standards and Technology (NIST) are urging Americans to return to the stone age for their own safety. "After discovering that 'thermal expansion' of steel from a low-temperature fire led to the collapse of World Trade Center building 7," said NIST spokesperson Noh Wei, "we started realizing that other metal objects might also be at risk". So NIST scientists tested other metallic objects using state-of-the-art computer models. The models predicted that every oven and barbeque in the country could disintegrate at any time, leading to a progressive collapse of entire houses. "We also determined that car engines, airplane engines, and boat engines could all suddenly fail due to thermal expansion," said Wei. "Indeed, we soon realized that almost all industrial processes could lead to catastrophic failure, other than, perhaps, those used in freezers." "Once you understand this principle of thermal expansion, you start to realize that even household showerheads and faucets are dangerous. The hot water flowing through them could wreak havoc. The President is committed to leading the way back to a safer time, and a return to proven, traditional materials - which may not be flashy like metal - but remain rock-solid even when warm." While it was previously assumed that metal was safe, scientists have now discovered that steel and other metals can suddenly fail due to exposure to heat. NIST urges everyone to stop using metal, and to reassess possible replacements with stone materials. Sunlight can warm up metal. Therefore, no metal should be used where any sun exposure is possible. If people choose to continue using metal, we urge them to live underground, to protect against the dangers of sunlight. Truthers have a great sense of humor. I really believe that we have friends on the inside with NIST. My theory is that some of our friends on the inside knew that the "explosive" hypothesis would never see daylight. So, they helped to devise a silly, ridiculous explanation which is full of major holes that any simpleton could see through as a lie. It makes JFK's "magic bullet" pale by comparison of fairy tales. I really think that it was a deliberate inside, covert attempt to bring down NIST and the official lies. ...I mean...come on...we all could think up a better "formal statement of lies" than what NIST came out with. TomT on Sun, 08/24/2008 - 7:07am. Is their a patent on the thermal expansion process? I think CDI could save alot of money in their controlled demolition technique. Simply stack a few chairs , and decks next to a column., and strike a match. I wonder if Danny Jawenko jumped on this new technology? WISDOM on Sun, 08/24/2008 - 12:11pm. should avoid jumping too high in one of these skyscrapers on warm days. simuvac on Sun, 08/24/2008 - 6:15pm. .......a NO FAT PEOPLE sign on the door? Or design the building with with springs on the connections to allow for expansion, and contraction? Make the floor like trampolines, that way if you get a collapse it can't turn into a progressive one. I also think they should install a vacume system on buildings to help keep the dust down. WISDOM on Sun, 08/24/2008 - 6:44pm. NIST: "fire versus explosives: fire wins!" As I quoted Buru Dragon here on 911blogger in my piece: "[A] reporter appeared to temporarily stump Sunder with a very basic but perfect question. Throughout the presentation Sunder spoke about building seven as if it were particularly susceptible to collapse by even moderate fires because of the design. However Sunder would later go on to explain that it would require a very large amount of explosives to bring it down by demolition... "if the buildings were so vulnerable to collapse due to regular fires alone, wouldn’t they also be equally vulnerable to failure with just a small number of explosives?" Sunder... proceeded to stumble through some convoluted explanation for why only fire could be responsible... [seeming] caught off guard and uncomfortable." You mean like a "truck" bomb? It's REALLY hard to knock down buildings with explosives. The Oklahoma City Bombing proved that. Fire should be so much better at getting the job done. Thanks for educating us NIST! However, the problem with this analogy is that the OK building was a concrete reinforced building. Concrete is heavier than steel. Which is why steel is the standard, not concrete--it's relatively light and very strong. "The federal building was designed by architect Wendell Locke of Locke, Wright and Associates , and constructed using reinforced concrete in 1977 at a cost of $14.5 million." 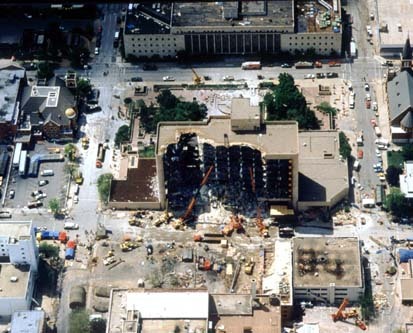 Just by coincidence Controlled Demolition Inc. and a host of people from NIST were involved in the OK bombing incident. And no, a single truck bomb didn't do that silly--that was also an inside job. Arabesque on Sun, 08/24/2008 - 10:41pm.